Watch where you are going. 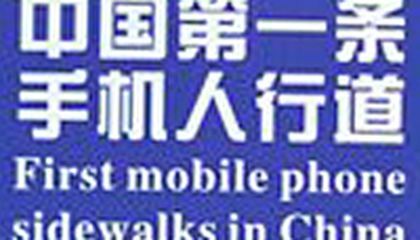 That's the message for smartphone users in the Chinese city of Chongqing. So a special sidewalk lane was created. It's for those who are messaging and tweeting. It's dangerous to tweet while walking the street, the property manager says. "Walking with your cellphone may cause unnecessary collisions," said Nong Cheng of Meixin Group. Meixin marked a 165-foot stretch with two lanes. One does not allow cellphone use. The other allows use of them. But if you use a smartphone there, it's your fault if something happens. Nong said the idea came from a similar path in Washington. It was created as part of an experiment. She said pedestrians were snapping pictures of the signs and sidewalk. They weren't paying attention to markings on the pavement. What do you think about messaging while you walk? Colossal squid is as long as a minibus! I think people are in great danger because they send messages while crossing the street. I agree with this article because people must get severe injuries by texting messages to other people. I feel very sad about people getting hit by cars while texting. It makes me feel like the person has done the wrong thing like texting and sending messages. I am very sad because people don't follow the sign on the sidewalk and get hit by a car. 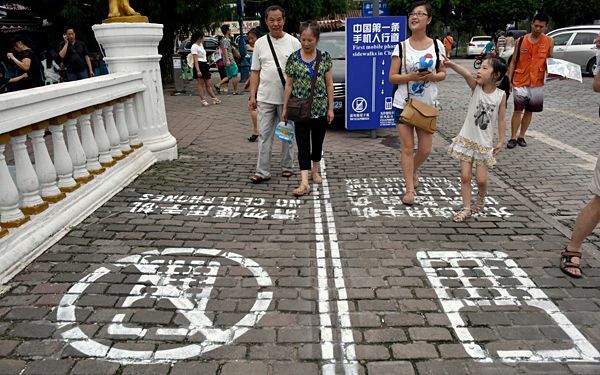 Wow that's funny how china made A side walk just for using a phone. What would you think if they had this sidewalk everywhere and would you use this sidewalk. Wow that is just a waste of money. Why don't you just get of your phone. Is this really needed? I bet that people while taking a picture of the sign they go in the wrong lane. This show how much we are on our phones. I just think this is crazy.